A stomacher was an essential accessory in women's fashion in the late 16th and early 17th centuries. It consisted of shaped piece of fabric, which filled in the gap between the fronts of a woman's open gown. Stomachers were often richly embellished to contrast with the fabrics and decoration of the gown. This example is roughly square with shaping for the armhole on each side, and laps (or tabs) at the waist in imitation of those on a man's doublets. The stomacher would have been pinned in place at the sides, under the gown. A ribbon tied through the lacing holes at the centre front would have attached the stomacher to the bodies (or stays) worn underneath and held it taut. 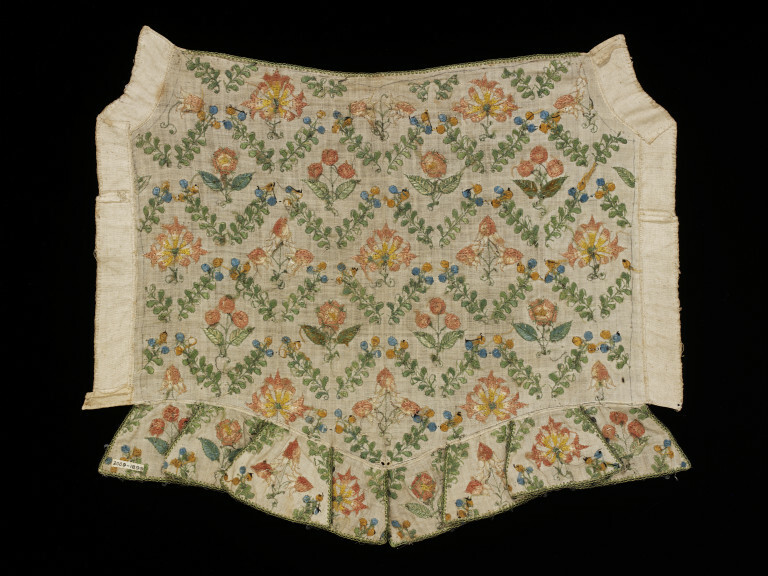 A stomacher of linen, embroidered with silk thread in shades of pink, green, blue and yellow, and silver-gilt thread in satin stitch and couching. The pattern consists of a repeating lozenge of leafed sprigs, filled with strawberries, cherries, roses, bilberries and honeysuckle. The stomacher has a straight upper edge embroidered with herringbone buttonhole stitch in green silk and a pointed waistline with two lacing holes in the centre, each bound with silk thread in buttonhole stitch. The lower edge has eight tabs of embroidered linen, each edged wth knotted buttonhole stitch in a herringbone pattern in green silk and silver-gilt spangles. A separate strip of linen edges each side. The stomacher is unlined. The thread count is 80 x 80 threads per inch, approximately. Length: 40.0 cm overall, approx., Width: 45.5 cm overall, approx. Purchased in 1899 from Bobby (Mrs Conyers) Morrell, together with a border of Italian cutwork and a 17th century French gaming purse for 12s and 6d. These were part of a larger collection of historical needlework purchased by the Museum from her between 1891 and 1903. Bobby Morell was the editor of the journal Home Art Work and a contributor to the feature 'Original Fancy Work' in Lady's Pictorial. For inspiration sheh woudl buy examples of historical needlework and reinterpret them in her embroidery designs for these journals. Each edition of Home Art Work featured from two to six designs for readers to embroider. Although copies of Home Art Work are in the NAL, the actual embroidery patterns were printed on separate sheets, which have not been preserved, so it has not been possible to match this object to one of Bobby Morrell's designs. 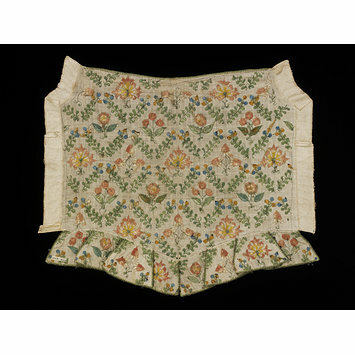 Stomachers were worn by women in the early 17th century to fill the gap between the fronts of an open gown. This example has no side eyelets, but would have pinned to bodies or stays worn underneath. This stomacher is not stiffened; a ribboned point through the two eyelets at the lower front would have held it taut over the bodies or stays.